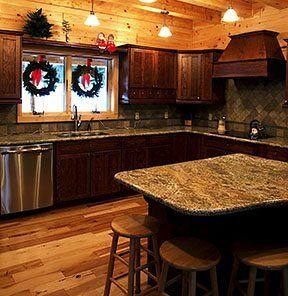 For many people, holiday entertaining is a big part of their new log home. 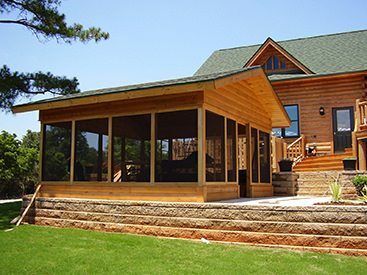 Gathering friends and family in numbers can be a challenge if your log home can’t comfortably accommodate the flow. We’ve put together some tips to consider when designing a home that will pay off during the entertaining season. Pay attention to traffic — We’ve all been to gatherings where everyone squeezed into the kitchen or clustered around the bar service area. These two “destinations” at a gathering need to have space so that guest can circulate and enjoy the party. Starting with an open concept is a good plan to accommodate entertaining, but pay attention to the location of party hotspots. Kitchens with island work areas can engage guests in the happenings before the meal without getting in the way of the cooks. Position the location of the bar or drinks station well away from the kitchen, so that a bottleneck between these two entertaining hot spots doesn’t develop. You’ll also want to make note of furniture arrangements, grouping pieces so that smaller, more intimate conversation groups can be easily formed. Provide for different activities— A media room separate from the main living area can offer those who want to watch “the big game” a chance to fully enjoy every play without taking over the entire celebration. If children are welcomed at your festivities, make sure they too have a place to play a board game or engage in outdoor activities if possible. A quiet corner of the great room could be a wonderful place to set up a toy racecar track or building blocks area. Double-purposing a guest room for a children’s video room will also reap rewards for busy parents. Allow for Decoration — If your traditions include a 12-foot spruce in the living room, make sure that you have a place that can accommodate the tree without too much furniture rearranging. Consider having the electrician install flush floor convenience outlets near the tree location so that lighting can be safely used. Consider installing anchors in strategic locations to secure top-heavy pines and prevent toppling. Other ideas to include for decorating include permanent china cup hooks on banisters, loft areas or above doorways to avoid adding and removing nails. Don’t Forget Outdoor Areas — If the climate isn’t too harsh in winter, including an outdoor kitchen or expanded grilling area may also be a great way to expand entertaining space. If it’s cool out, a fire pit and a big electric tureen of spiced cider or hot chocolate could provide some wonderful options in a busy home. If your guests enjoy sledding or cross country skiing, a small shed with benches can provide protection from the wind and a place to change from boots to inside shoes. 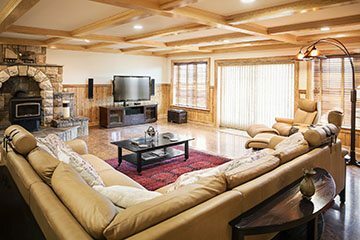 Have Fun with the Details — If a man cave is an important element to your entertaining style, equip it with some unique elements to appeal to your guests’ sense of whimsy. Instead of a stock beer pump, try Bison Pumps’ new Beverage Pump. 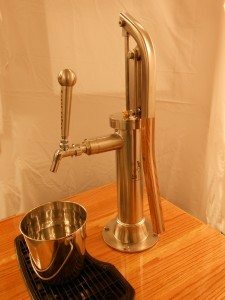 It installs either directly on a bar countertop over the refrigerator or on a freestanding “kegerator” to provide a thoroughly unique way to pour your favorite malt beverage or carbonated soda. The Bison Beverage Pump can pressurize the beverage without the need for a CO2 canister, and so simplifies the process. The basic model is stainless steel, but liquid transfer printing is also available for a custom look. Sound Systems — Music can provide a festive backdrop to your entertaining. Many smaller speaker options are available with Bluetooth or mp3 player connectivity. The latter can allow guests to plug in their playlists, or the host to preprogram the background ambiance. If your sound system is a hardware system, make sure a remote control option is available to mute sounds from anywhere in the main area. Sleeping Arrangements— If holiday entertaining includes overnight guests, a loft area or room above a garage can easily be set up to handle overflow. Consider rustic bunk beds, built-in beds or pull down Murphy-style beds to transform offices or craft rooms into sleeping areas. If some relatives plan to arrive with motor coaches or RVs, one idea would include creating an open gravel parking area with nearby electrical hookups to accommodate travelers in their own space. Facilities Management — If you’ve set aside enough space when designing guest bathrooms consider separating the commode from the sink and mirror area, so that guests can attend to makeup or hand washing while leaving the facilities free for other guests to use. If you’re expecting a big crowd, and it’s not too chilly out, some portable toilets companies offer some pretty fancy options for big groups.